In all honesty – huge and fed up now. Yesterday was my due date. This time round I’m not worrying about going overdue, as I have a plan in place for getting baby out this week. However that’s not to say that reaching 40 weeks pregnant hasn’t come without it’s challenges on my body physically and emotionally. Let me tell you. For the past 6 or 7 nights I have barely slept. The little one is determine to try and escape at night. The contractions have started. Only they are contractions that are not doing anything. I believe it’s false labour, as we actually went into hospital two days ago to see what was going on. They are contractions, but they’re not opening my cervix which is still fully closed and posterior. Trying to survive the day on virtually no sleep is pretty impossible, and right now I am counting down the days (or hours) until my planned c-section date on Wednesday. Coupled with the lack of sleep, is pain. Some days are better than others. At some points I have had a contraction every 2 to 3 minutes which is enough to think that you are ready to go to hospital. The pain has been intense from these, and usually strikes me when I’m walking up and down the stairs, or lying down. Luckily it stopped yesterday, and although I feel frustrated with this stop start approach to early labour, it was so nice to have a break from it, and actually get on with a few things. Now this is weird one, but I am actually struggling to sit down. I think it’s because the baby is slow low, that it’s pretty much sat on a nerve at the bottom of my tail bone. Going to sit down causes a whirdwind of pain, and then after sitting down for about two minutes I need to be standing again. I am trying to stay calm and relaxed, but the stopping and starting, and no sleep is starting to take its toll. I feel like I’m walking around like a zombie in a fog (a bit like after you’ve had a baby type fog). It’s exhausting being up for most of the night, and then worrying the next day that the next night will be same again. My body is definitely testing me and putting into practice the long nights with a new baby. Coupled with the pain I’ve been feeling pretty sick. I guess it’s a combination of little sleep and pain. I haven’t actually been sick, but it’s a feeling of “I’m going to be sick”. Argh! Having a bath is a huge relief, the pain is instantly taken away. I’ve resorted to having a bath in the morning and evening, which is a little bit excessive. However if it makes me feel better I need to do it, plus I won’t have much opportunity for one, once the little one arrives. Over the last week or so I feel like I’ve been really neglecting my toddler. It’s been so hard to play with her, especially because all she wants to do is build a boat from the cushions on the sofa, or wants me to put her on her swing in the garden. It’s been tough. Fortunately she has been whisked off on a short holiday to my parents house for a couple of days, to allow me to rest. My parents are so good for offering to do this, and it was lovely to not be woken up at 6am this morning by someone bounding into our bed wanting to watch Peppa Pig on my phone. I’m sure that she is having a fantastic time, that is much better than being here. OMG I never experienced this with my daughter. The back ache is insane at the moment, I’ve currently got the TENS machine going in hope that it helps. 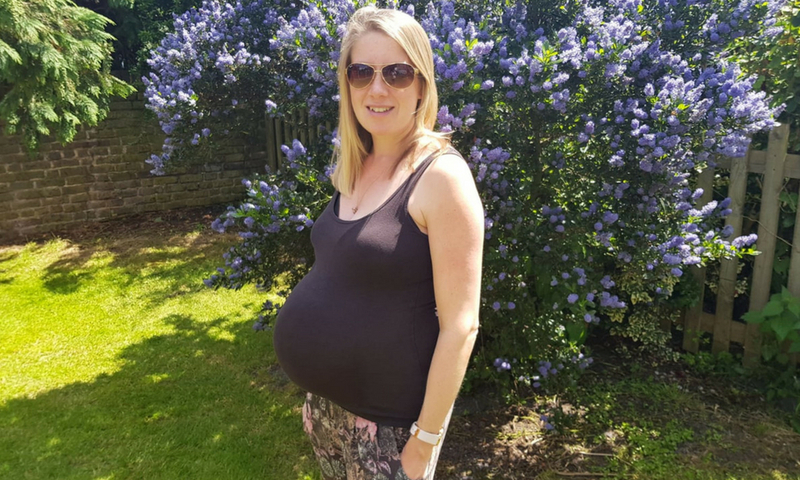 Getting to 40 weeks pregnant is a huge achievement (a milestone) it only feels like yesterday that I wrote my 37 week update and broke the news to you all. And, as I write this I am one day overdue. I shouldn’t moan as I’m sure that others reading this may have felt like this for weeks, or be completely fed up by now, or questioning me that I should be grateful that I am pregnant, which of course I am. I know that it’s not going to last much longer, and I know that I need to enjoy these final few days of having a bump. It’s just so bloody difficult when you’re knackered and in pain. How did you feel getting to 40 weeks pregnant. Were you pretty much the same as me, or feel like you were glowing, or just really fed up and wanting to meet your bundle of joy?